Coming off a difficult 1–9 season, the Lions enter 2018 with more confidence as they try to contend in the WJFL National Division. Cherry Hill West football works on plays prior to its season-opening game last week against Cinnaminson High School. The 2017 season was, in the words of junior Johnny Ioannucci, an “experience” year for Cherry Hill High School West football. The Lions went just 1–9 in 2017 with new player at 18 of the 22 starting positions. Five of the Lions’ nine losses were by eight points or fewer. 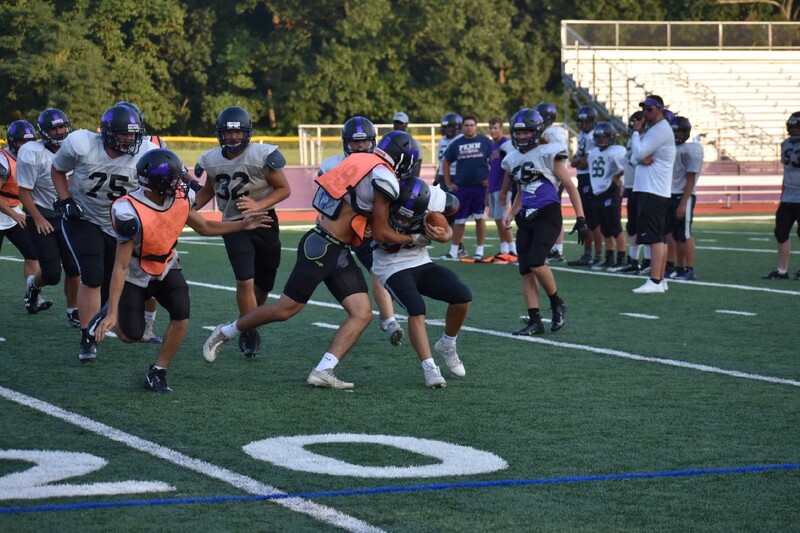 This year, expectations are much higher for Cherry Hill West. With most of the starting lineup from last year back, head coach Brian Wright believes his team can contend for the West Jersey Football League National Division title. Wright is confident after seeing what he believes is an improved Lions team in the preseason. Wright said there’s a greater level of confidence around this year’s team than there was last year. “As much as it was bad last year at times, you can tell out here in training camp it has definitely paid off in the long run,” Wright said. That confidence begins at quarterback, where sophomore Nick Arcaroli will take over the starting job after former starter Monte Williams transferred to Camden High School. Arcaroli, a three-sport athlete, got some playing time on the varsity team as a freshman. Arcaroli said he is embracing his role as the starter and worked hard over the summer to prepare for the season. “This whole offseason, I’ve been working with my quarterback coach, reading defenses, watching film and just taking control of the game,” he said. Arcaroli will have some returning players and a couple of new faces to work with. Leading the running backs will be Carlos Gomez, a player Wright says is one of the more dynamic backs in South Jersey. Ioannucci is also expected to play a bigger role on offense this year. Ioannucci is a wide receiver, the backup quarterback and is also expected to receive time at running back this season. Cherry Hill West will also have some new wide receivers who can make an impact. Junior Hakim Melvin transferred from Camden Catholic and Arcaroli said he has gelled immediately with the offense. Wright is also excited about freshman Jesse Filkill, who could see time with varsity this year. Cherry Hill West’s biggest strength may be at the line of scrimmage. Wright believes seniors Max Sullivan and Dorian Davis may be one of the best linemen duos in the region and expects them to control the game on the line of scrimmage on both sides of the ball. Wright believes his team has the ability to put together a winning season in 2018, just two years after going 8–2 in 2016. Arcaroli said the team has bought in and now just needs to put in the work.